We all love our headphones and enjoy the privacy they offer us, but at the same time, we have to be conscious of the dangers headphones present. A lot of people crank up the volume to unhealthy levels and damage their hearing long term. The great advantage of headphones is the ability to hear every little detail in the music, this is why professionals use headphones instead of loudspeakers. With headphones, the sound travels directly from transducers to the eardrums without distortion. Hearing loss can have a substantial effect on the ability of the person to hear musical details which negates the use of high-end headphones. Using headphones responsibly and learning how to avoid hearing damage should be one of the things all audiophiles and even regular headphone users should be aware off. Are Bluetooth Wireless Headphones Safe? Are Noise Cancelling Headphones Safe? How to Know if My Headphones are Too Loud? How to Set Safe Volume with Headphones? When to See a Doctor Immediately? With every new technology there is a chance it’s harmful to the human body. Bluetooth has been around for a while but some people still question its safety. In short, yes. According to the latest scientific research no data shows a connection between using Bluetooth and any adverse health conditions. In short, Bluetooth doesn’t affect your body’s health. In fact the opposite is more true. Because Bluetooth only works in short range it actually emits less radiation than long-range mobile antennae. So when you’re using your phone for talking you receive more radiation than if you used a Bluetooth headset or headphones/earbuds with a microphone. The Bluetooth emits similar signal as a Wi-Fi except much weaker. And most people have no problem being in a Wi-Fi covered area so you definitely shouldn’t worry about Bluetooth. It’s perfectly safe. WHO’s International Agency for Research on Cancer report about phone use and cancer finds there is no connection between the two. Phone use and radiation seems to have no impact on higher occurrence of cancer. While this technology is relatively new and proper scientific research requires longer studies, only more time will give us a more definitive answer. But keep in mind, the studies that have been done until now don’t find anything harmful with wireless Bluetooth headphones. Some people might hear about the new so called noise cancelling headphones that use a new technology of “cancelling” noise. And the question of “Is noise cancelling technology safe?” arises. The fact is this technology isn’t as new as you’d think. It was first used in “headphones” in the 1950s while the technology patent alone was first granted in 1936. Not so new huh. But it is true noise cancelling has become popular in the last few years. Now if you understand how the technology works you’ll understand there is no way this tech could harm you with. Basically, the microphone picks up the surrounding noise and sends that information to the headphone’s circuitry. The circuitry then create an opposite sound and send it to the headphones so the sound “cancel each other” before they reach your ears. This way you don’t hear all of the ranges that are actually present in your surroundings. It’s a pretty technology no? Noise cancelling technology can’t harm you in any way, but using too high of a volume can. Read more about this below. From the picture above you can imagine how the sound travels down the external auditory canal, also called ear canal, to the tympanic membrane or eardrum and makes it vibrate. 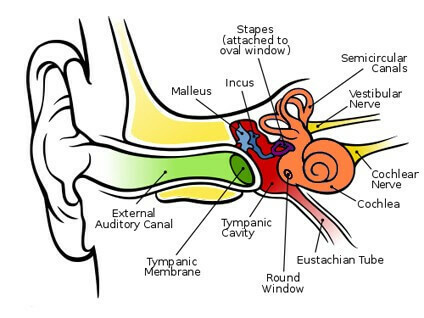 Eardrum transfers the vibration to the 3 bones called Malleus, Incus and Stapes which amplify the sound. The last vibrating bone, also the smallest bone in the human body, Stapes, is attached to the Cochlea which, with the help of fluid and sound sensitive hair cells, transforms the vibration into electrical signals traveling to the brain. This is a simplified explanation of how the ear hears the sounds and sends its information to the brains. The table on the left shows how fast hearing damage can occur at different levels of volume. The louder the sound, the faster hearing damage occurs. OSHA (Occupational Safety and Health Administration) permits workplace noise levels of up to 90dB for an 8-hour workday. Additionally, higher volume exposure is also permitted, but for shorter periods of time. Many people experience loud and thus harmful noise levels daily, but because they are exposed to the sounds for shorter periods of time the harmful effects don’t show immediately. Keep in mind that hearing damage can accumulate over time, but because it occurs gradually, over many years, it’s almost impossible to recognize the difference in your hearing. Your hearing might be damaged because of cumulative effects in your environment, but because you don’t have anything to compare it with, your brain doesn’t alert you about it. The only real measure of hearing damage can be done with a medical examination by a doctor which you should visit if you are concerned about your hearing ability. 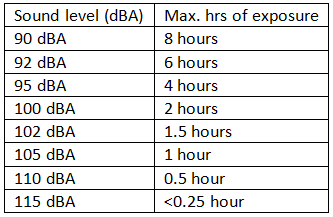 Statistics for the Decibel (Loudness) Comparison Chart were taken from a study by Marshall Chasin , M.Sc., Aud(C), FAAA, Centre for Human Performance & Health, Ontario, Canada. There were some conflicting readings and, in many cases, authors did not specify at what distance the readings were taken or what the musician was actually playing. In general, when there were several readings, the higher one was chosen. Some musical instruments can also produce damaging noise levels though long term exposure is usually avoided since music uses different levels of noise. If you visit concerts with loud music frequently you might have a problem with hearing damage over time. Some research suggests that loud, constant noise incurs more damage than music which is perceived as pleasant by the listener, but it is best not to count on it. Conductive hearing loss occurs when the conductive mechanism which transfers sound vibrations from middle ear canal to internal ear doesn’t function properly or at all. The damage can occur due to disease, various conditions and loudness abuse. Conductive hearing loss might result in hearing all sounds at a lower volume while the ear still functions properly at a higher energy needed to hear the same intensity. You can still hear all frequencies, but your ears require more energy (loudness) to send an audible signal to the inner ear and brain at the end. Most often than not conductive hearing loss can be treated to completely or partially remove the hearing impediment. Various medical treatments combined with hearing aids substantially improve the patient’s ability to hear normally and thus help the patient to communicate normally with those around. Sensorineural hearing loss is, as the word tells, a combination of sensory and neural hearing loss. A sensory and neural (also known as retrocochlear) hearing impairment can exist in one ear only. The only way to differentiate between the two is with in-depth audiometric testing. The most common reasons for sensorineural hearing damage is inner ear or auditory nerve damage. The damaged organ of Corti (also called spiral organ) and damaged hair cells, being unable to stimulate the nerves, are most commonly associated with sensory hearing loss. The inability of the hearing nerves to send over the neurochemical information is the most common cause of neural hearing loss. Even with today’s modern technology in the medical field, it is not always possible to determine the causes of sensorineural hearing loss and it is harder to treat than conductive hearing loss. More often than not it is a permanent condition that can only be treated at symptomatic level with hearing aids. Keep in mind that with sensorineural hearing loss can not only cause lower sensitivity to loudness but also distortion or inability to hear certain frequencies even when they are present at an otherwise audible level. Mixed hearing loss is, as the name suggest, a combination of sensorineural and conductive hearing loss which can be improved only by treating the sound conductive mechanism while sensory and/or neural damage is helped with hearing aids. This condition is permanent and professional medical help is required to remedy the condition. Keep in mind that hearing damage is not always permanent and can occur temporarily after being exposed to damaging situations. Timely medical treatment can in many cases help the patient to completely recover from the loss of hearing. Additionally, pretty much all people are subject to gradual hearing loss. The effects of gradual hearing loss can accumulate over time, but because this happens over many years it is very hard to spot and seek medical help soon enough. Any of the above symptoms can occur when you are exposed to loud noises for an extended periods of time. When you are in a club with loud music for too long it is very common to experience many of the symptoms described above. Thankfully after some time your hearing should improve, but if you keep abusing your ears like this the damage can become permanent. If you are using an amplifier and a powerful playing device it is very easy to crank up the volume to unhealthy volumes unknowingly hurting your hearing in the long run. If you experience any of the symptoms above after using headphones, this is a sign you have listened at too loud volume. The Fletcher-Munson loudness curve above shows how the perception of music is changed at different loudness levels. 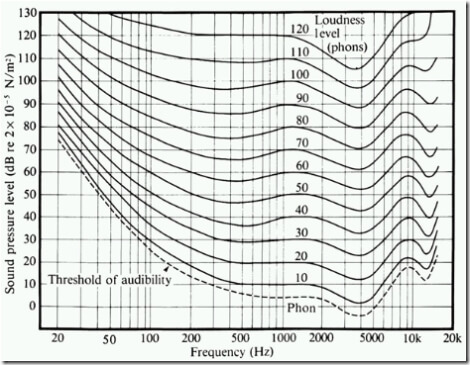 Loudness depends on volume and frequency of the sound. This is why lower volumes are less fun to listen to. You can clearly see the non-linear curve in the picture above. This explains why so many people want to increase volume for music that they like. With some tone rebalancing you can adjust the amplitude spectrum at lower volume levels to have a more pleasant sound. Unfortunately the dynamic filters needed to adjust the spectrum is not available to an average user and are only being used in professional production. With the equalizers present in many modern playing devices you can adjust some frequencies to produce a more natural and more appealing sound. The adjustment of treble and bass, high and low frequencies will give you best results. Setting a safe volume level with headphones depends on the type of headphones used and the environment. Since most people don’t have a SPL (sound pressure level) meter just for figuring out the safe volume levels, you have to use different methods. Turn up the volume of headphones to your preferred level then take them off your ears and hold them in your hands extended in front of you. If you can still hear the music clearly, your headphones are too loud. This method works only in peaceful environment and don’t give the right volume information in noisy places. If you are using open-back headphones the good way to tell if your volume is healthy is the ability to have a normal conversation with another person nearby. As long as you can carry a conversation with open-back headphones on, your volume is low enough. Headphone use on loud, busy streets is slightly different. 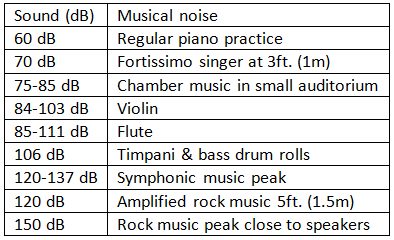 A study conducted on music volume people use in a busy street showed many people increased the volume because of the environment noise to higher than 80 dB (up to 80 dB is not dangerous). 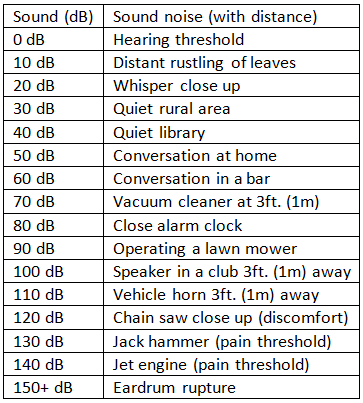 Majority of people use dangerous levels of volume in noisy, public areas. To save your hearing from cumulative damage, get a pair of noise isolating earbuds or noise cancelling headphones. These types of headphones are good at removing unwanted background noise so you can enjoy your music without hurting your ears. If you are using headphones for professional use, an audio limiter is a smart idea since it will protect you from over abusing your hearing in the long run, nevertheless, same principles apply, but you probably already know this if you are in the music business. If you experience any of the following symptoms it would be wise to seek medical help as soon as possible. The doctor can in many cases prescribe medication that greatly reduces long-term hearing loss. The solution is to be conscious of the fact that headphones can be dangerous to your hearing if used the wrong way. Whenever you experience any of the hearing loss symptoms, remember to lower your music volume or shorten the time you are being exposed to loud music. We know it is not always possible to avoid high decibel noises. When you listen to your favorite tunes on a busy street, keep in mind that overpowering the street noise isn’t healthy and will results in hearing loss over time. You can still enjoy your music with a pair of really good noise isolating or noise cancelling headphones which will help you keep the volume at healthy levels. In the end, just knowing that hearing loss with headphones can happen will probably make your more careful of how you use them. Don’t be afraid to go “crazy” from time to time with blowing the volume to the max, but keep in mind that practicing this habit regularly will have an effect on your hearing long term. Nevertheless, headphones are a great piece of technology that make it possible for you to enjoy music anywhere you go in high quality, it would be a shame to get hearing loss by not using headphones the right way. Kyle, Jim, Causes of Hearing Loss, University of Bristol. Occupational Noise Exposure, Occupational Safety and Health Administration, Department of Labor. Roland Mieszkowski, Marek, Common Misconceptions About Hearing, Digital Recordings.